Right at the end of August 2014, I set off to Italy for 3 weeks backpacking, with a history and culture binge thoroughly in my sight. This is going to be a longer post than those I’ve written previously as there is much to cover and I feel like the trip is one big story. But never fear, there will be lots of pictures! I’ve divided it up into sections too, based on where I was staying. Travel wise I flew in and out of the country, and got around by train from city to city, buying tickets either on the day or the day before. Fast ticket machines are a wonderful invention, not just for the purchase of a ticket but actually researching how long journeys take, how to get from A to B to C and so forth. I had my buddy Matt with me for the 1st week which was great. We arrived late on Saturday (August 30th) into Naples (Napoli) airport and decided to get an early night as we had a lot planned. Monday was an amazing day. We went around Pompeii and then up to the top of Mount Vesuvius. 2 of the things i’ve always really wanted to do. 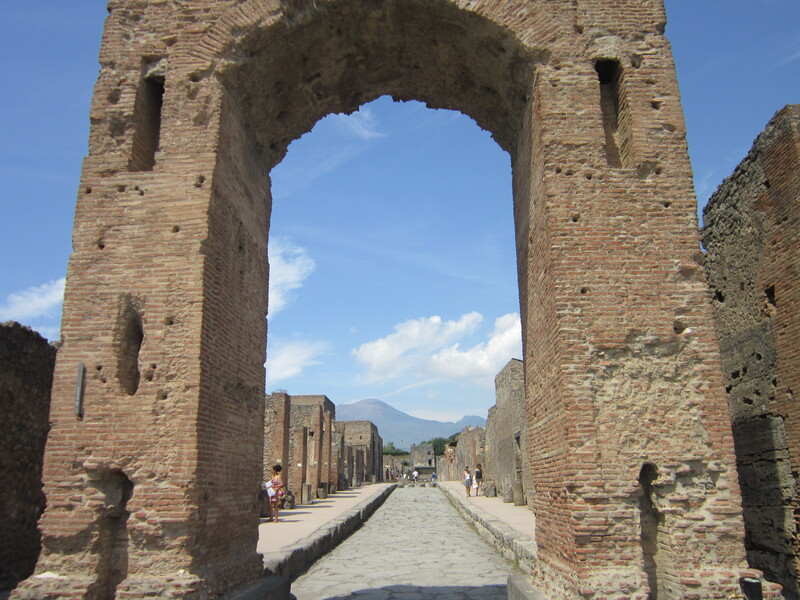 Pompeii of course is the city that was buried by the eruption of Vesuvius in 79 C.E. It really is as awe-inspiring as people make it out to be. It felt kind of odd (in a good way) exploring the ruins, all the streets and buildings, seeing all the structures and so forth. Really made me think about what life must have been like back then, more so than reading a book or internet article could do! Pompeii with Vesuvius in the background. To get to the top of Vesuvius you get a bus up to near the crater, and walk up the rest of the way. It’s an active volcano so there’s that extra special feeling when your reach the top and stare down into the crater! 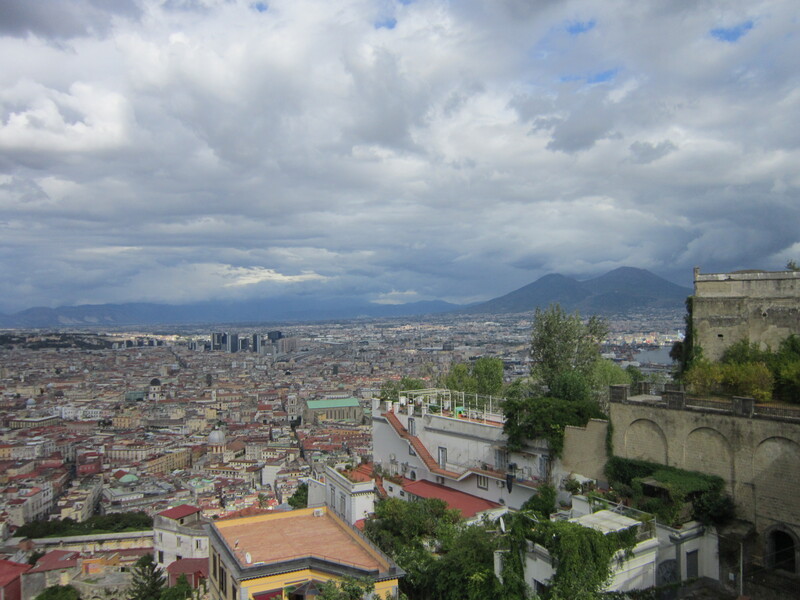 The views over the Bay Of Naples are spectacular as well. And being up there thinking about where I was standing erupted and destroyed the city i’d been exploring just a couple of hours earlier definitely made me appreciate the power of mother nature just that little bit more! That evening another of the ‘I’ve always wanted to do this’ things was achieved as we had pizza in a pizzeria in the center of Napoli (just for reference I prefer the Italian spelling Napoli to the English spelling Naples so i’ll stick with using that). And yes, pizza in Napoli is damn tasty! What an amazing first full day in Italy! Day 2 me and Matt set off by ferry to the Isle Of Capri. Whilst the journey over there was ok it did keep raining whilst we on the island, but that did not distract from the evident beauty and the sun did pop put now and then! We went for a walk around the east side of the island, where the town of Capri is situated. 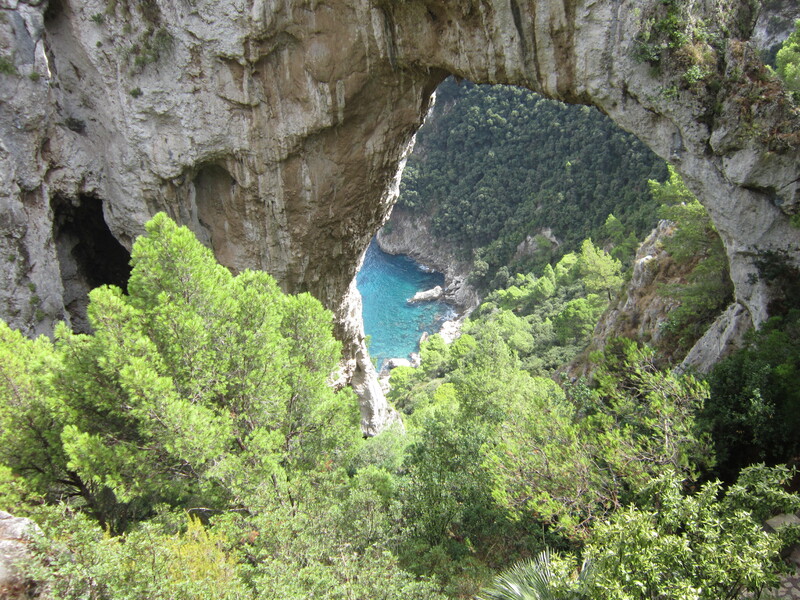 The particular highlight was the Arco Naturale, which as the name suggest is a naturally formed arch, which has an amazing view of beautiful blue water through it. 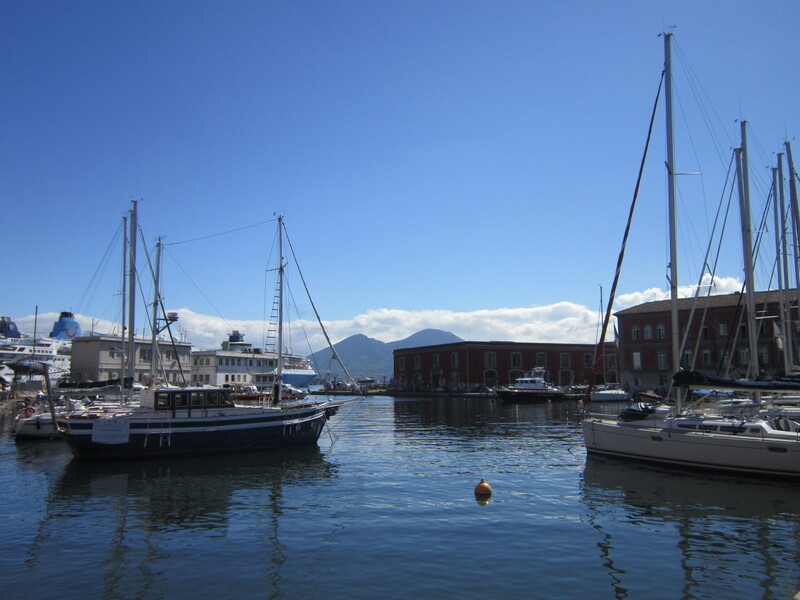 The views as we walked along the coast were great and the harbour in Capri was very pretty. The storms and wind meant the boat back was pretty bad, lots of people got seasick though me and Matt survived intact. In the evening we went out with our roommate for Helana for pizza (kind of a theme here….) and then spent some time at the hostel making friends! We were staying at Hostel Of The Sun, the atmosphere was really nice. Among others we made friends with Hannah and Jess, both from England, Callie from Texas and Shaun from England (playing his guitar in the hostel which was really fun). Day 3 and Me, Matt, Hannah and Callie went exploring Napoli. I know Napoli can have a bad reputation but I absolutely love it. I love how lawless it feels. I love the people selling things on the street, that North African feel. I love how old the buildings are and how there are pizzerias selling nothing but margarita’s. Sure, it may be dirty but that’s part of the charm. I am sick to death of all the highstreets in the UK looking identical no matter whether you are in Devon or Durham, i’ll take the anarchy of Napoli over that any day. Anyhow, now that’s’ established, we walked along the waterfront and visited 2 forts, one of them (Castel dell’Ovo) we went all around and on the ramparts. 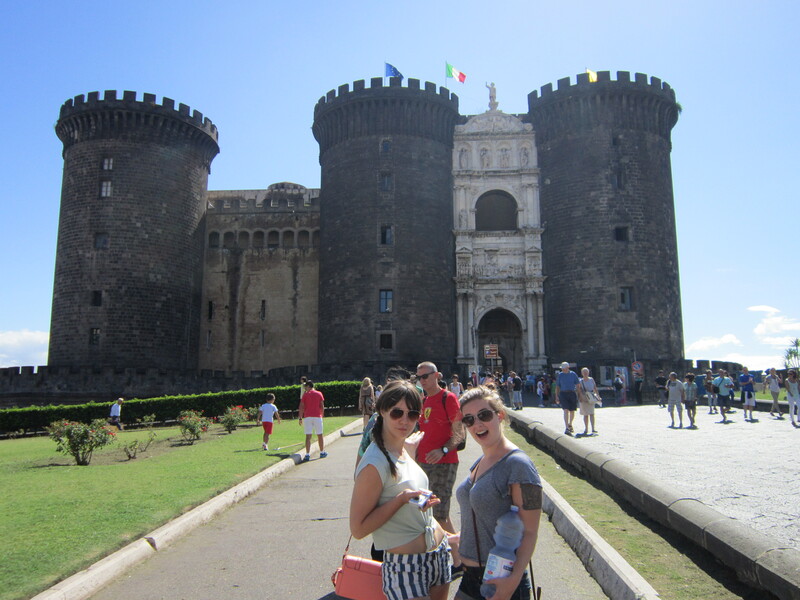 Both Castel dell’Ovo and Castel Nuovo are very impressive landmarks. Following lunch by the harbour we (I ate something other than Pizza. Be proud of me) headed to the cable car in the city, which takes you up to by Castel Sant’Elmo. Alas it was closed by from the area there were some spectacular views of the city, with Mount Vesuvius in the background. Truly epic. On the way down back to the hostel we walked along some of the famous Spaccanapoli street. It sort of divides the city, the way it is very long and straight. The evening was more good times at the hostel! Morning and of course, all roads lead to Rome! Me and Matt said our farewells and headed with another of our roommates, Jana (from Deutschland) to get the train from Napoli to Roma. We got the cheapest available, and although the carriages were very old and lacked air con we didn’t mind and it was quick and so much cheaper than rail journey’s in the UK cost! Plus kinda fun to have all the windows open on a high-speed train and feel the wind in your face. Me and Matt said bye to Jana and checked in at the hostel, we stayed at The Yellow, which is pretty well-known among backpackers! First task was a wander around the city to get our bearings. 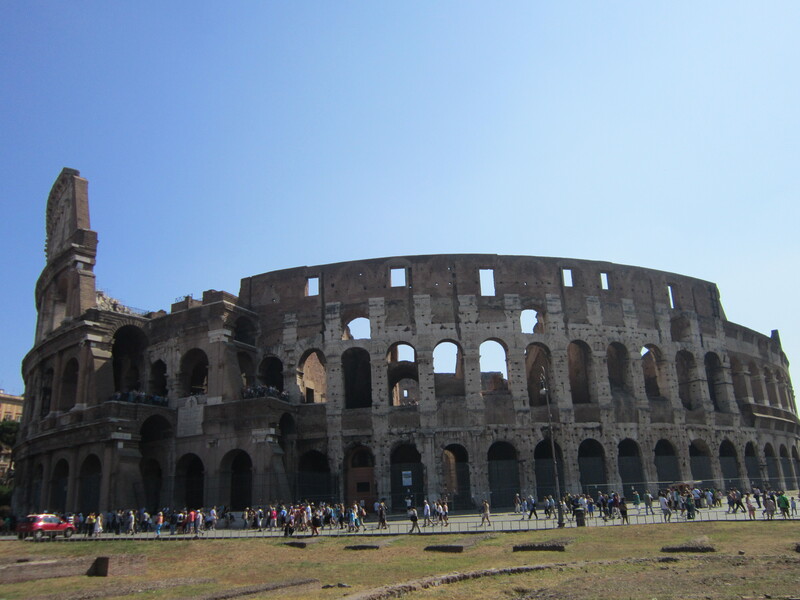 We walked around the outside of Colosseum (it’s really epic, more later!) 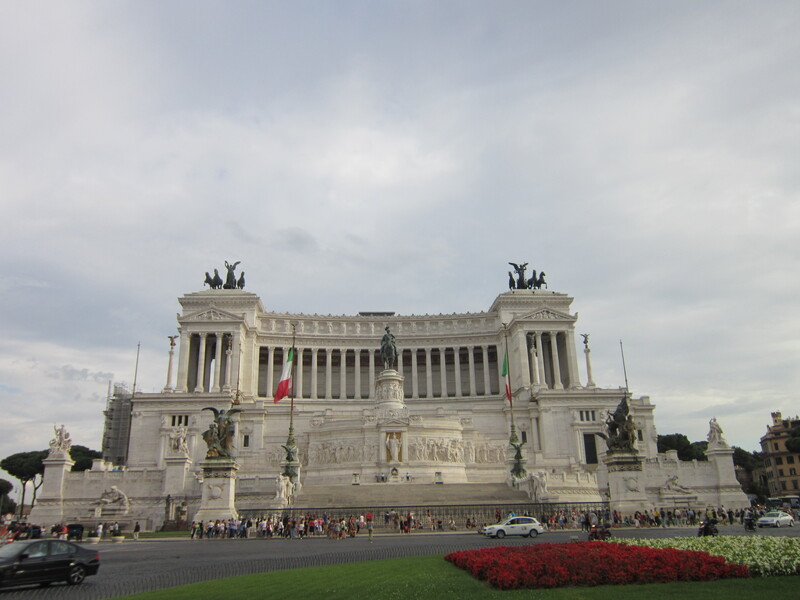 and went to see the National Unification Monument (Altare della Patria). By chance my friends Beka and Aaron were on holiday in Italy at the same time as us and in Rome as well for our first 2 days! So we went to meet them for dinner and afterwards went to a Metal bar for a drink! Wandering back across the city at night was a fun experience, cities are always different at night, much quieter. Thursday me and Matt headed to Vatican City. After attempting and failing to give Mass, we embarked on a journey around the Vatican and saw the fantastic St. Peter’s Basilica and Sistine Chapel. I am not religious but still the art, architecture and history of the place are astounding and well worth seeing. 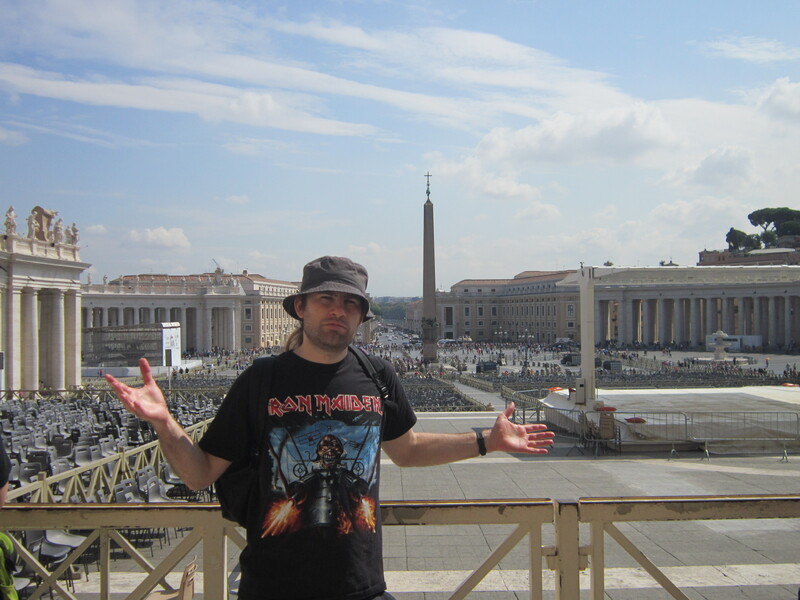 The Vatican museum was great too and we spent some time in there, seeing all the exhibitions. That evening we met Beka and Aaron again at a nearby (to our hostel) Greek restaurant. Was really awesome getting to see them whilst we were there! When we said farewell me and Matt said we were going to have one drink at the Yellow. Well that turned into about 10 drinks as that hostel is really good for meeting new people and we made some new friends. One guy was a West Ham, wearing their shirt, and I ended up running into him a few more times in Italy! Weird how that happens, the greatness of backpacking I suppose! Matt spent the evening chatting to guys named Jacob and Joshua (Dane and US) and I ended up hanging out with them later too (will come to that). 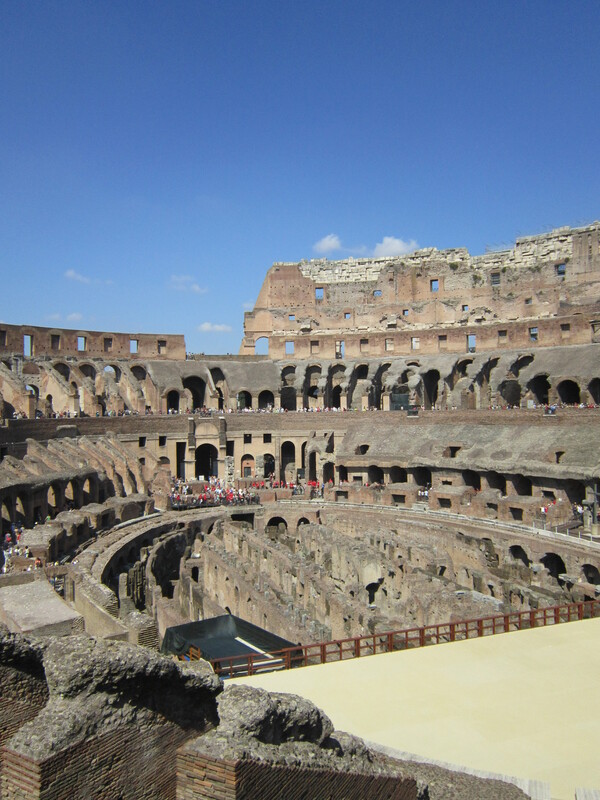 Friday and time to see the Colosseum. It blew me away. It is truly magnificent. 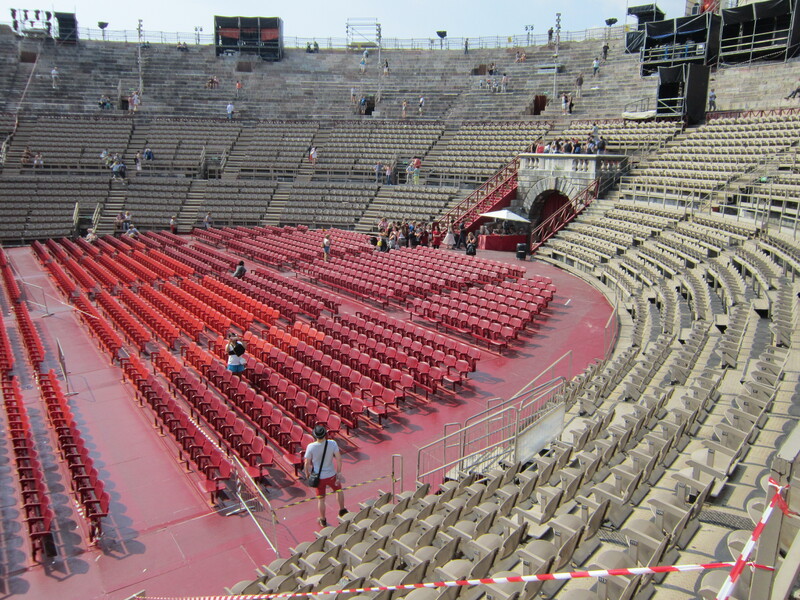 To think about it’s history, how people have viewed it over 2000 years (it was constructed in 70-80 C.E), how it was host to between 50,000 and 80,000 spectators watching gladiators and alike….mind blown!!! This is a site I have always known and thought about in a grand way, from history books through to computer games like Civilization and Rome: Total War, but to actually see it in the flesh, to walk around it’s corridors and touch it’s stone….wow. I think as well coming from Bath which is a Roman city I always had some kind of affinity for Roman empire, and I was not disappointed to see what is the most grand monument to its legacy. 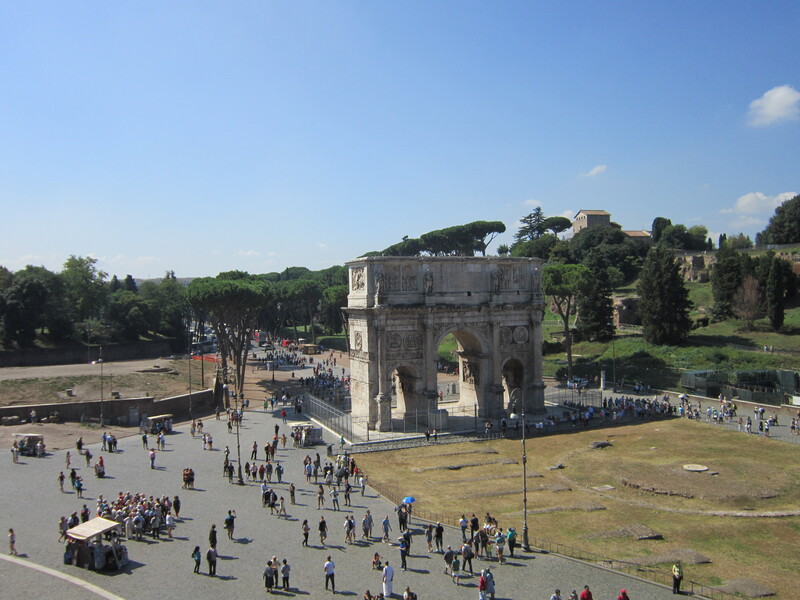 Nearby is the Arch of Constantine which is a triumph arch built by the Roman’s in 315 C.E. Arch of Constantine, as seen from inside the Colosseum. 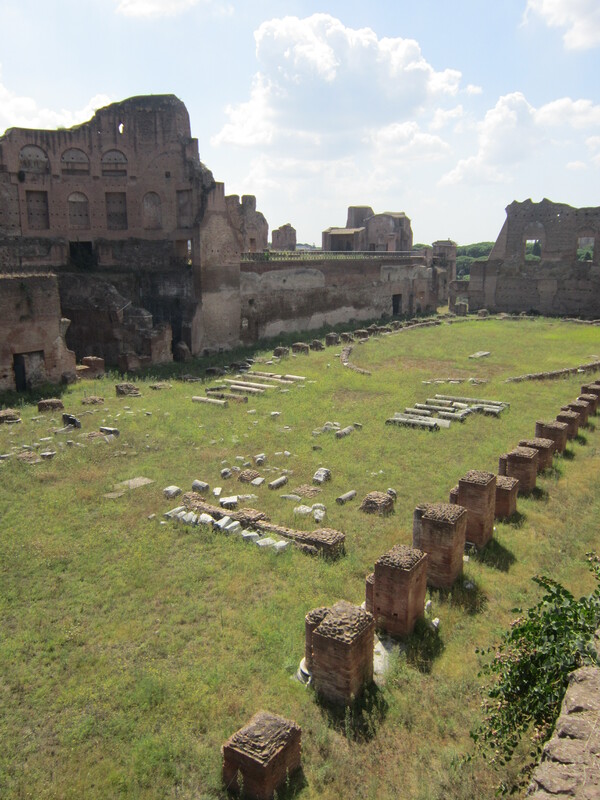 To the right of it is Palatine Hill. 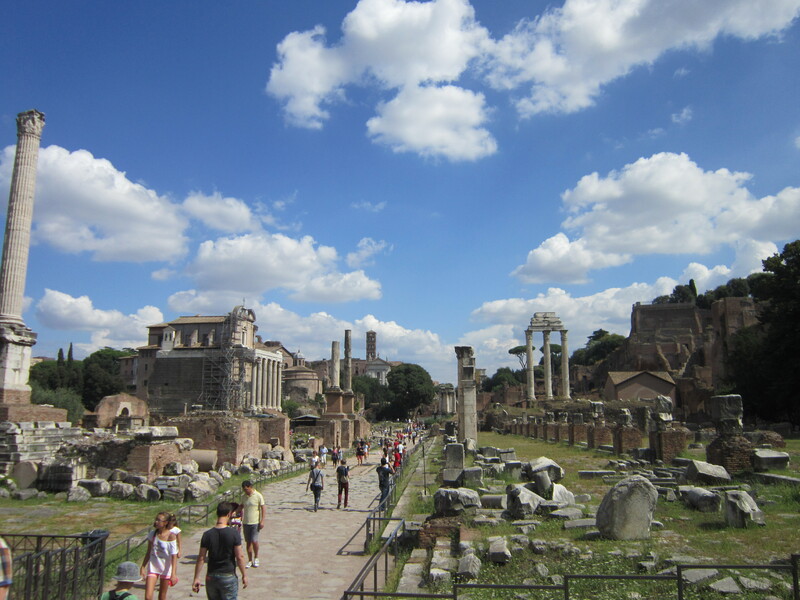 Next up was exploring the wonderful Palatine Hill and Roman Forum sites, which are adjoined to each other. It is full of statues, ancient buildings and ruins. The Palatine Hill looks down on the site of the Circus Maximus which was a huge site for Roman games and public entertainment such as chariot racing. The Hill itself felt pretty relaxed, there wasn’t an abundance of tourist information which I actually preferred as that can feel forced sometimes, and it was nice to walk around the top where it was really sunny. We ran into Jana on our walk around it too so was cool to say hi to our train buddy! The Roman Forum has a lot of awesome buildings packed into a smaller space, it was once the site of the marketplace and was used for public speaking and as the center of Rome, as such. There are shrines and temples to various Roman Gods which is ace. After a late lunch we visited the Pantheon which is another interesting and important building which has been around since Roman times. In the evening the Hostel was very lively, there was a big group of us up partying, it was much fun. Some were from the night before, plus we made friends with our room-mate Sarah and her friend Tegan (Canadians) and Shaz from Australia. A very great day from start to finish! Our last day in Rome me and Matt went to see the Capuchin Crypt, which is beneath a church. It essentially is a religious space decorated with the bones and skulls of Capuchin monks. 3,700 of them, apparently. At any rate it is a fascinating thing to see, and makes you think about life and death. After that we saw the ‘Lateran Obelisk‘ which is the largest standing ancient Egyptian obelisk in the world. Roman imperialism at work. Unfortunately Trevi fountain was having reconstruction work done to it. We also saw the Spanish steps (which were ok) and Castel Sant’Angelo, which is a fortress/castle near the Vatican. I really liked Castel Sant’Angelo, we walked all around it and up to the roof which gave some good views of Vatican City. It was built-in 123 – 139 C.E. and it is a museum these days. It’s very striking when you are approaching it over the nearby bridge, with statues of angels looking down upon you. At the hostel everyone we’d been drinking with the night before was about again so it was another great evening. In the morning, after a hungover breakfast with my drinking buddies from the night before, I said farewell to Matt as he was returning to the UK. Time to continue on to Florence! Jacob and Joshua, who’d been drinking with us the past 3 nights, were also heading to Florence (Firenze) which meant I had some travel companions! We made friends on the train with 2 girls, Kirsten (New Zealand) and Lyndsey (England) and after i’d got to Florence and checked in I met up with Kirsten and Lyndset to go for dinner and explore. 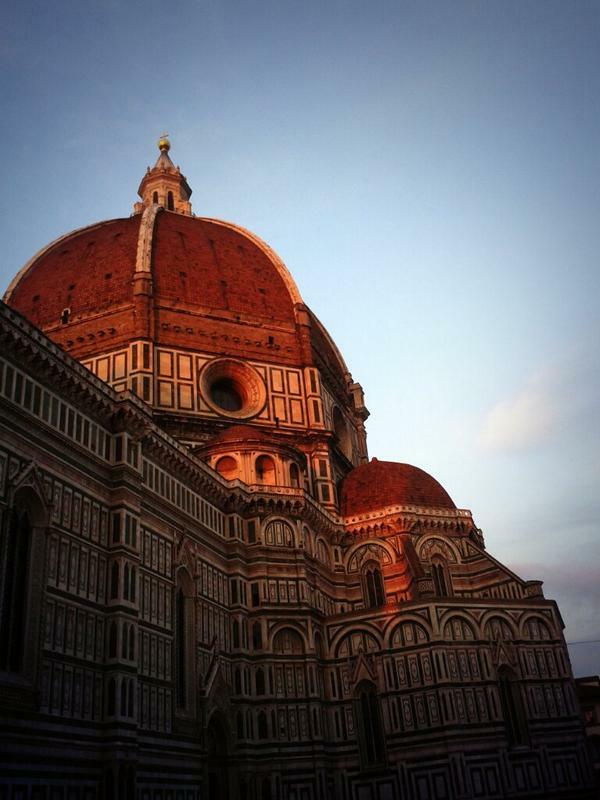 The first big ‘wow’ of Florence was the Duomo. It’s a massive cathedral right in the middle of the city. We saw it first at sunset, so the light was catching it and giving a glorious red tint. Exploring towns at night is fun. That there is less people than in the day is the obvious benefit, but also the streets feel different and it’s just an all round different vibe. I got very excited when we came across the Ponte Vecchio bridge as it was one of the bridges that inspired Pultney Bridge in my home city of Bath. The big deal about it is that it’s a ridge with shops across its span and there are only 4 in the world built this way. We also embarked on a search for the best Gelato in town and came across a sort of carnival/party in a square. Next day we walked around the city some more. 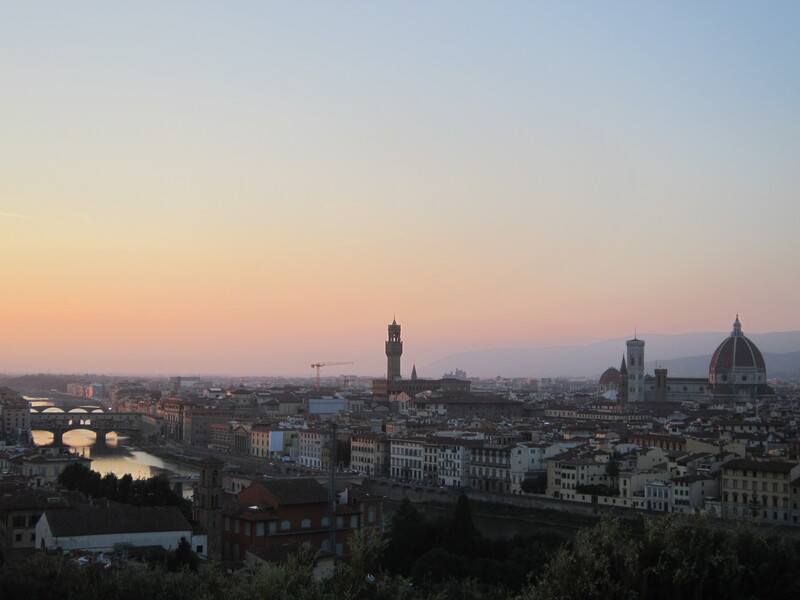 In the evening we watched the sun set from Piazzale Michelangelo. You get a great view of the city, especially the bridges over the river. After that we met up with Jacob and Joshua and watched football in an Irish pub (standard). 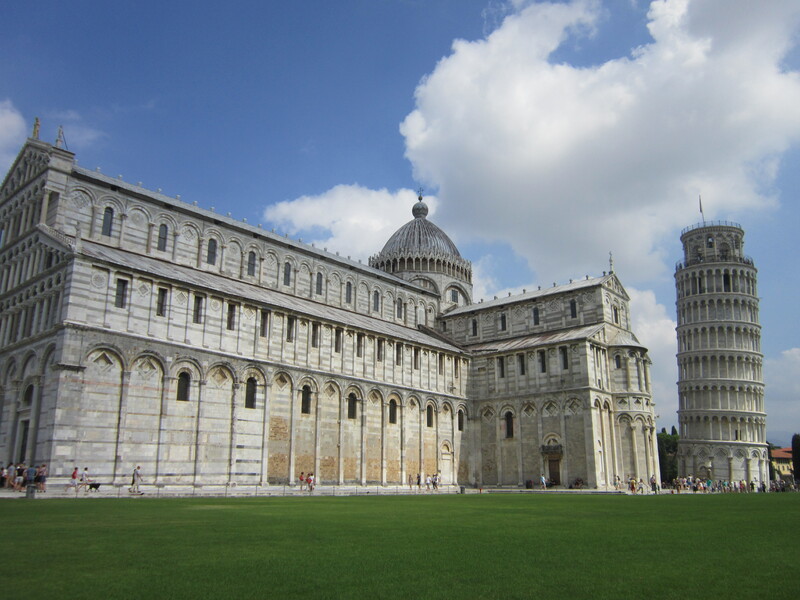 Next day I was by myself and I headed to Pisa to see the Field Of Miracles. I decided not to join the endless queues to actually get int any of the buildings, it more a fly by ‘stare at the pretty buildings and take lots of pictures’ approach. It’s very impressive, I can see why the Leaning Of Tower gets so many visitors for sure and the other buildings are all very nice too, especially the Cathedral. There were literally hoards of tourists, those guides you’ve read are no exaggeration. The town itself seemed quite nice, I stopped to grab some food and have a look around a couple of the squares and streets. The next task for Florence was a day of museums. I braved the queues and went to see The David and explore the Uffizi. 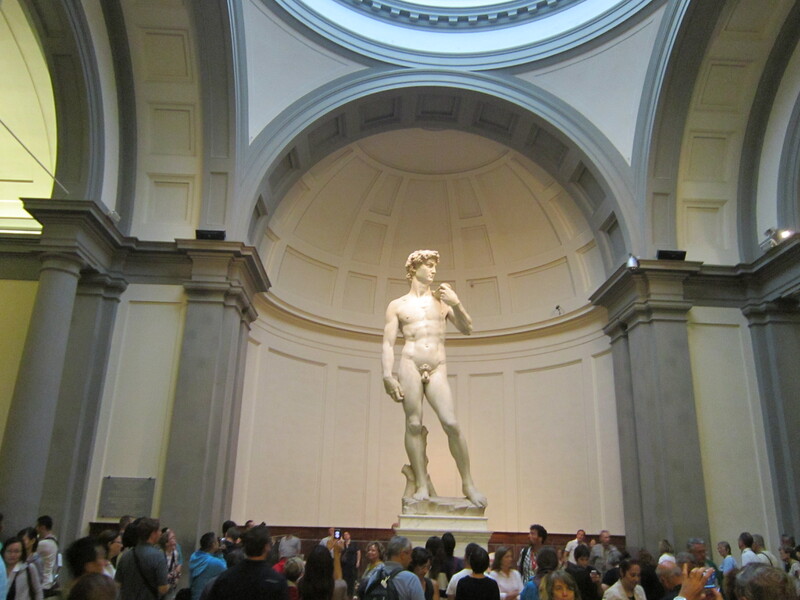 The David is a marble statue created by Michelangelo between 1501 and 1504. it is very, very impressive. Picture with tourists so you can see the scale. The Uffizi is an art gallery and considered one of the most famous in the world. I spent a fair amount of time admiring the work inside. My last day in Florence I went inside the Duomo, including to the roof and then up the neighboring tower ‘Giotto’s Campanile‘ which gives great views of the city and the Cathedral itself. I also went for a walk around more of the city, including along the river area. In the evening the hostel put on some food and win so was nice to socialize with some fellow backpackers. The hostel was pretty quite in that regard otherwise. To summarise Florence,. I was bit disheartened by the amount of time spent queuing for the attractions and having spent the evenings in Napoli and Rome partying it was a big change to be a quite, sleepy hostel. But putting all the aside, a great place! 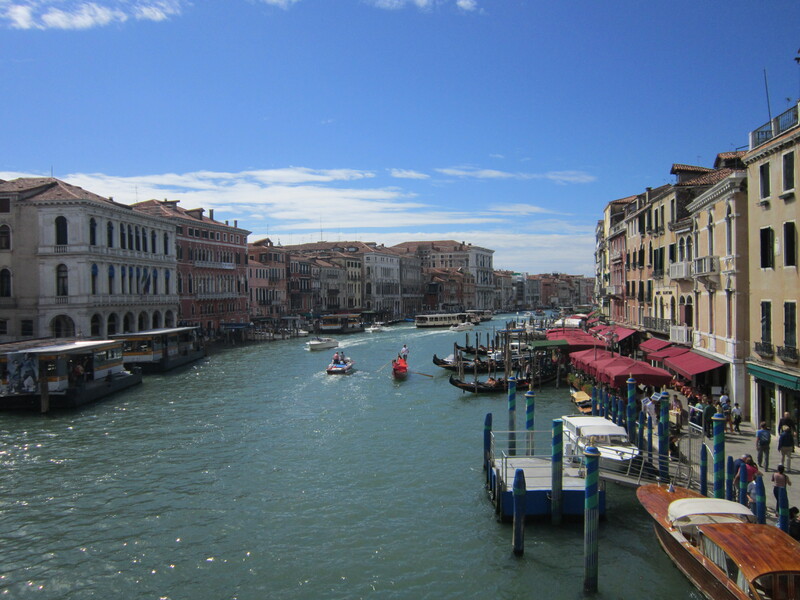 I met back up with Kirsten and Lyndsey to travel to Venice. They managed to oversleep and miss our planned 4:30am train which did mean me sitting in McDonalds for a couple of hours biding time and using the dregs of wifi to alert them where I was, but we made it there in the end and it was all good, I didn’t mind! So Venice. Well, I love it. I have been asked since then if its ‘romantic’ and I think the answer is ‘if you want it to be’. For me, I just loved how novel it is to have to get around by boat and how streets which seem to be going somewhere randomly end in canal! I’m sure if you were there as a couple then the setting could fulfill those romantic requirements, but I was there on my own hanging out with other backpackers i’d met, my interest was far more in the layout of the city. One thing is for sure, if it wasn’t for tourism the city wouldn’t exist as it is anymore, that’s for sure. I was staying in a hostel on Giudecca, which is one of the islands, it’s the south side of the city and you can only reach it by boat which I found really fun! The main thing to do in Venice is wander it’s streets and appreciate it, and I spent most of my 2 days there doing that. 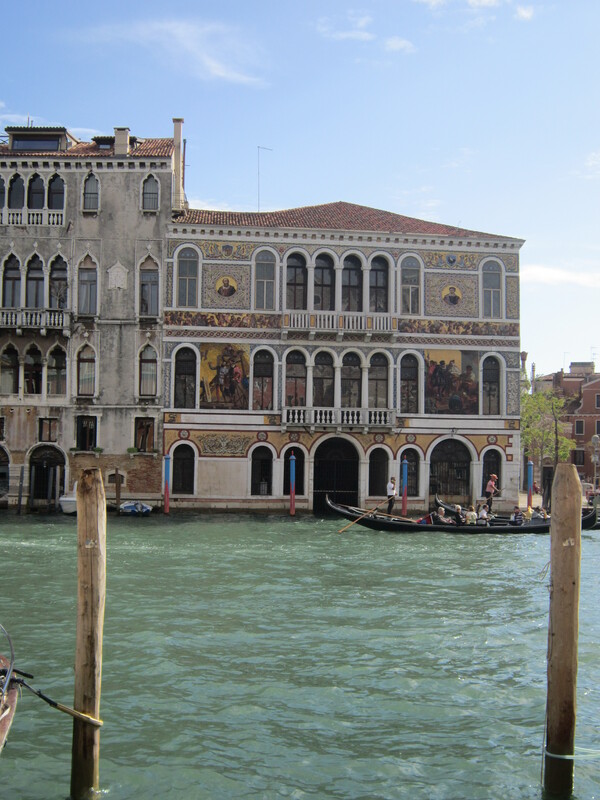 The main sights other than that, for me, were San Marco square, which was a bit flooded when I was there, but not too much, and Ponte di Rialto bridge, another bridge with shops on! Again, being from Bath I appreciated this extra so! Social wise I spent the first day with Kirsten and Lyndsey and we met up with Jacob and Joshua again for dinner. Turned out Sarah and Tegan who i’d met in Rome were also in the hostel to see them too! On the second day, after walking around for hours and then watching football in an Irish pub (standard) I met up with Sarah and we went for an evening stroll around the streets, and found an area with a couple of pubs (well everyone was mostly congregated outside of them as they were very small!) where we had a couple of drinks. My next place, which I spent 4 nights staying in, was a town named Peschiera del Garda. This melt like a massive change of scenery compared to what had come so far. It’s a town on the south side of Lake Garda and it’s very much a Holiday maker spot, not so much on the backpacker side. The hostel stayed in as very new and shiny, though not many guests. I did hang out with a few people there which I’ll cover in a sec. 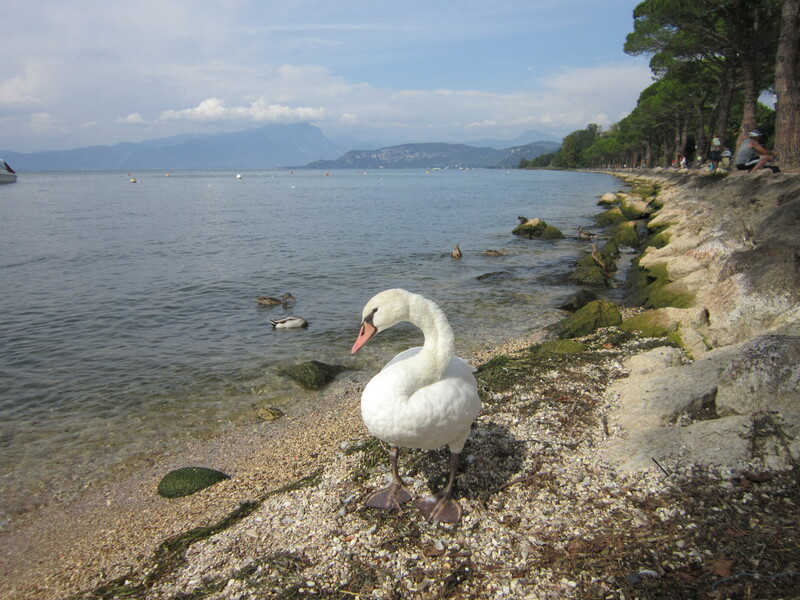 Lake Garda is the largest lake in Italy and it is very beautiful. The water is very calm and on the other side of the lake hills and mountains provide a nice backdrop. Sunsets were particularly great! The lakeside itself is pleasant when not in the super tourist areas, and I went for a few walks alongside the lake, including visiting Sirmione and Lazise which are your standard tourists towns, pretty all the same. Sirmione is the more lively of the 2 and has an old castle/fort. There are also some Roman ruins but they were closed when I visited, plus a beach area which you could sort of walk around the tip of (the town kind of juts out on a piece of land like a spear into the lake). Peschiera del Garda itself is known for its fortifications, there is a kind of fortress island, the canals and it’s harbour, which all make make for an interesting layout to the town. 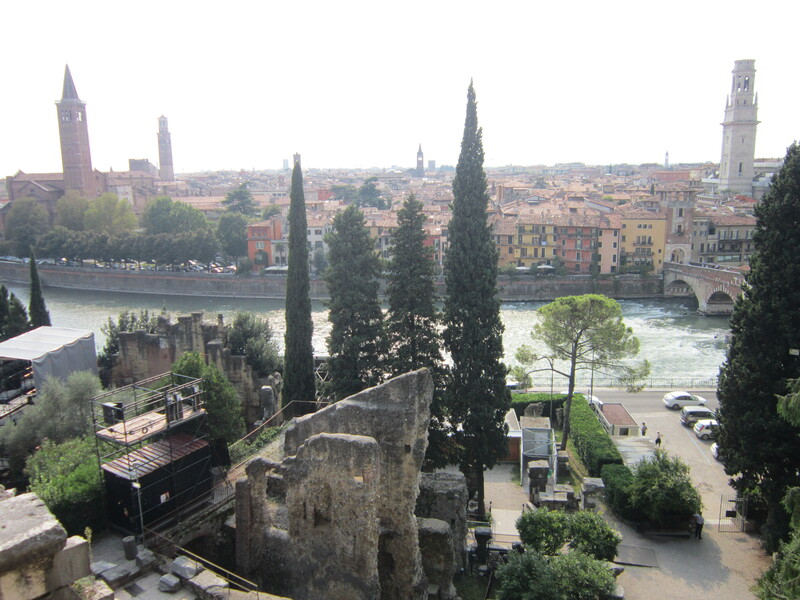 On my 3rd day there I went to visit Verona. It’s a very interesting city, I love it. A mixture of Romeo and Juliette, Roman buildings and ruins, awesome views and cool buildings. Romeo and Juliette wise it’s where the story is set, and off of Via Cappello you can find ‘Juliette’s House’ through a tunnel covered in love notes and graffiti messages of that nature. There is a balcony (wherefore art thou Romeo?) and also a statue of her. Roman wise the most spectacular is the Roman amphitheater, which was a predecessor to the Colosseum in Rome (it was built-in 30C.E. ), and in some respects a practice run at it. You can pay to go in and walk around its halls and seating area, and it still hosts performances to this day. Through the city and across the river there are some Roman ruins, and of particular note a Roman Theater which again is still used today. From there and the hill it is on there are some great views across the city and the river Adige. Walking around the city and it’s river, there were some great buildings, both from an architectural viewpoint and a ‘wow that’s pretty’ viewpoint. I definitely fell in love with this city! As for the rest of my time in Peschiera del Garda, well the thing to do in the evenings is to go out for dinner. I am slightly worried I may have gotten myself a reputation whilst there as the 1st night I went out with 2 of my room mates, a Polish girl and a Dutch girl, the next 2 nights I went out with 2 other room-mates, both German girls, and the last night with 2 Scottish girls from the room next door….. The meals were very good, generally pasta or pizza of course, and the town is very pleasant in the evening. The last night the hostel was quite lively and there were a few people around drinking, and I ended up with 2 German brothers and a couple of Aussies getting pretty hammered. Me and 1 of the brothers managed to find some kind of outdoor club in the town for the last hour of its open time, which despite being as terrible as you can imagine, was oddly fun! 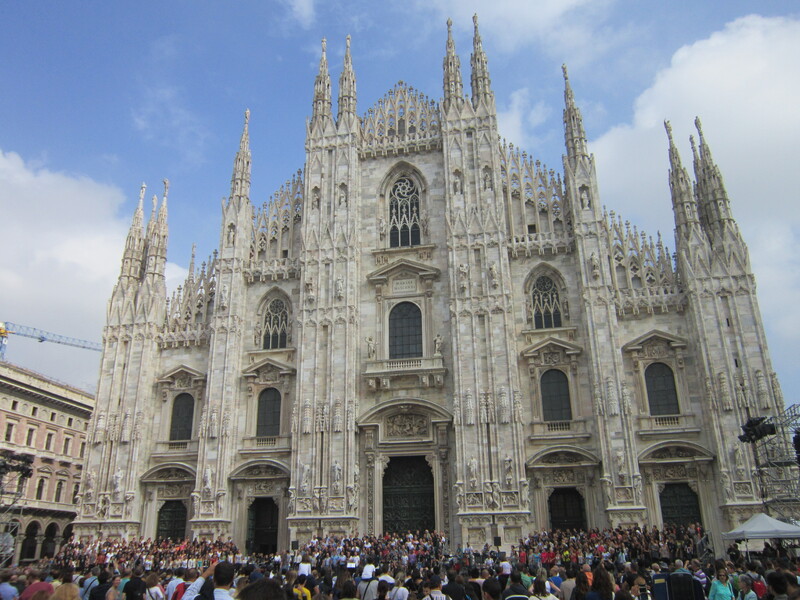 The last stop of my Italian adventure was Milan for 3 nights. I’ll be honest, I didn’t particularly like Milan, it reminded me of a smaller and worse London. I think part of the problem was I was staying in a crappy area of the city in a crappy hostel. Though I did enjoy chatting to roommates there, it wasn’t very sociable and lack of willingness to spend the time, money and effort getting to the center for nightlife meant a fair bit of sitting around in the evenings doing not a lot. It was also grey most of time I was in the city, and two of the cities big things is shopping and fashion which I care nothing for. There were some redeeming features to the city though. 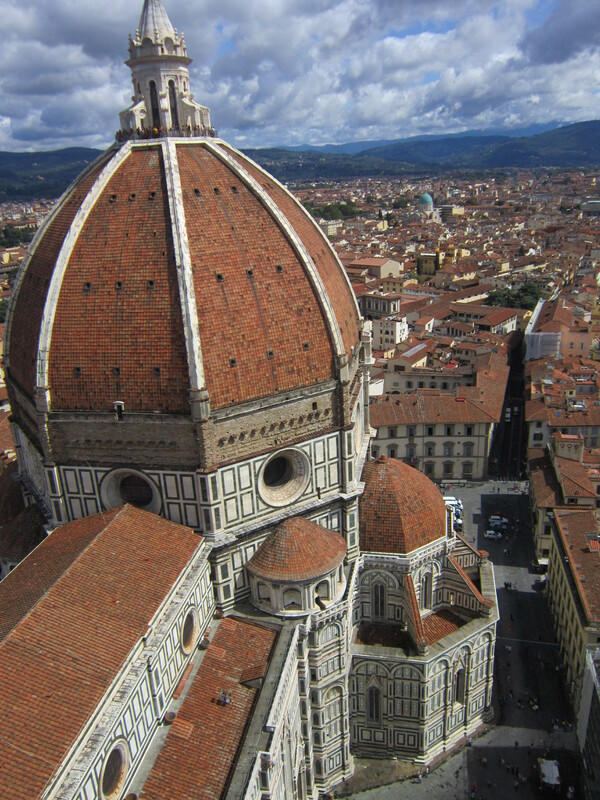 The Duomo is very spectacular, it’s huge and you can explore both the inside and the roof (for a fee of course). On one of the days there was some kind of choir outside of it, singing away and all that. Looked impressive at any rate! There is also a castle, Castello Sforzesco which houses an art gallery (Pinacoteca del Castello Sforzesco) and museum. It’s well worth a look. I also visited another art gallery, Pinacoteca di Brera. Between the 2 of them there was a lot of great art. and I mean a lot! Many masterpieces were gazed upon. There are also a couple of parks that I walked around that were very pleasant. Milan done and it was time to fly back to England It had been a great 3 weeks, i’d explored a lot and seen many of the sites i’d always dreamed of visiting. I know there is so much more to see in Italy though, particularly on the coast and in the south (the Amalfi Coast and Cinque Terre are 2 places i’m particularly keen to visit), and I shall endeavor to return one day to explore more. My trip was very city focused, a big history and culture binge, so next time I shall have to focus more on other aspects of Italy. Thank you 🙂 I’m glad you enjoyed Italy, it’s a great country, really like it there!